Even unintentionally, Corey Jackson inspires me to eat in Lynn. This morning I was planning to take Route 1A through Lynn when Corey posted a picture of the awful Lynnway traffic on Facebook. 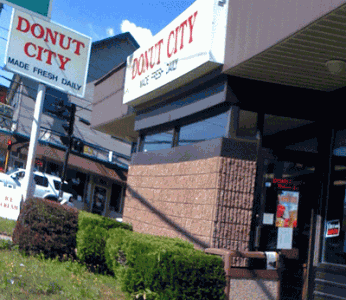 Having no desire to experience it for myself, I decided to take Route 107, conveniently passing directly by Donut City, which sits at the intersection of Western Ave. and Chestnut Street. A small, independent, family-owned shop that’s been open about a year and a half, Donut City makes donuts fresh each morning. I had been meaning to check them out, and this was the perfect opportunity. Everything looked so good, I ended up leaving with a variety of treats to share with my colleagues. Both the raised and cake donuts (.75 each) were terrific. My all-time favorite, the chocolate frosted old-fashioned cake donut was excellent. The crunchy fried outside encased moist cake and was topped with chocolate icing that didn’t overwhelm. The raised doughnuts were heavenly—even the glazed was feather light, and the raised cinnamon was a revelation. That’s the one I’ll go back for. 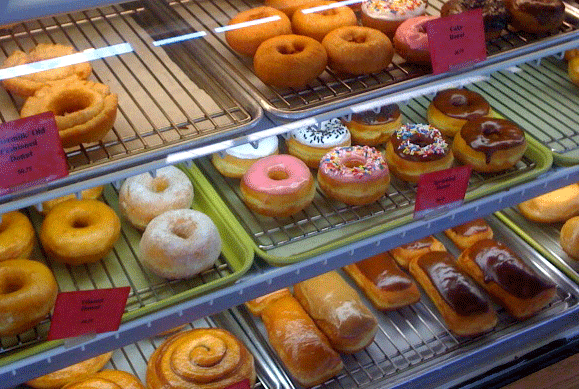 Donut City offers muffins in two sizes, (.79 for small and $1.65 for large) and produces a variety of unusual flavors along with the old standbys. Who could resist a Boston Cream Pie muffin? I certainly couldn’t, and I threw in a pineapple coconut one for good measure. My colleagues were quite happy with the decision. 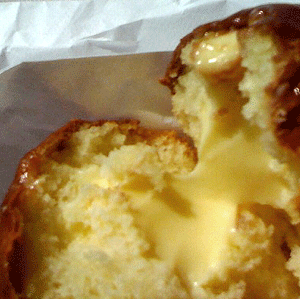 The muffins were moist, lightly sweet, and had a nice springy crumb—the Boston Cream Pie drew raves. I was interested to discover that aside from a myriad of sweet treats, croissants and breakfast sandwiches, the shop also offers fresh, hot, savory meat pies. 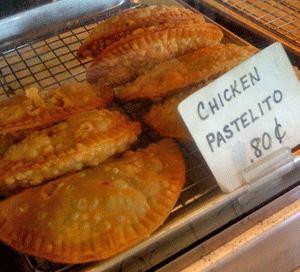 The chicken and beef pastelitos (.80 each) looked so good, I opted to try the chicken then and there. A crisp pastry filled with chopped meat, onions, and sweet peppers, it was delicious. A couple of those and a coffee and you’ve got yourself a bargain lunch. Speaking of coffee, I was excited to see that Donut City carries locally roasted fair trade coffee from Beverly’s Atomic Café. The quality and freshness of this unassuming corner bakery blows chain store donuts out of the water, so don’t wait until the next traffic jam to stop by. Thanks for this article. I was wondering where to get some great croissants for a brunch. I went there after reading the article – everything looks great. I order croissants for a brunch tomorrow. Nice they open at 6AM also! The Cambodian sandwiches are awesome too! Only $ 3.50 and full of delicious spices and fresh veggies and meat. The 39 and 40 are yum!